I got a few text messages last week that I didn’t know how to answer. “Do I have to use Peach?” they read (emphasis mine, but you get the idea). These friends of mine are referring to the newest social networking app, one that was causing a bit of a flurry — first in the tech world, then in the media world and now, seemingly, in the world world. But people quickly want to know, if it’s something to use not necessarily because it’s fun (which Peach happens to be, for now) but because it might become a ‘big deal’ — and you might get left out. “I should get my username, right?” is what everyone imagines during the first clamorous days of discussion about a new, trending app. So you sign up, and then you’re left not quite knowing what’s next—whether you should actually use the app or not (and, if so, for how long). Is it something that will only be used for fun between friends or will it drift into the sphere of personal branding (like Twitter or LinkedIn)? There’s only so many places one person has the energy to put content and build audience, only so many places one person has the energy to exist online. So, should Peach be one of them? Those who are ranting that Peach is just another app with a short life cycle aren’t exactly wrong. The New York Times got right down to the issue in a feature on Peach, with a memorial of past social apps whose popularity didn’t survive infancy: “Their names are barely remembered: App.net, Ello and Path were among those that had their moments of celebrity.” Peach’s own creator Dom Hoffman is a cofounder of Vine (which continues to live on the successful side of this dilemma, and became popular among brands and celebrities — not just teens) and Byte (which is pretty cool, but completely ignored). Peach could go either way. 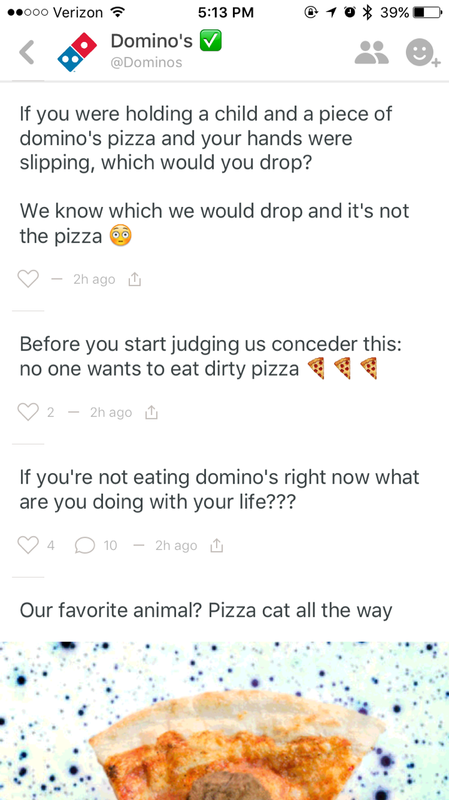 The app asks you to post GIFs, finger-drawn images and status updates, offers prompts like “What’s in your shower?” and makes it easy enough to post anything—basically, without thought. That’s thanks to their shortcut library called “Magic Words,” which identifies words like “battery” and will quickly post your battery charge. On Peach, B is for battery charge. The experience combines the fun and privacy of a 2006-era Facebook wall with Tumblr’s image-centric-flow of Internet Crap. Peach has no main feed, so if you want to check out what your friends are ‘up to,’ you’re going to have to click through one-by-one—which will likely prevent you from ‘making’ too many friends (and will eventually make it hard for brands to build an audience on the app). For now, the intimacy of the Peach “community” is its greatest value — users feel more free to say whatever they want without consequence (no sharing!) when they think just their friends are watching. It’s a break from the scroll — the “cascade,” as some have come to call it — that we’re faced with when we open Twitter, Facebook or Instagram. And it’s about individuals, not feeds. An update on Peach from my friend Andrew, who’s clearly killing it already. 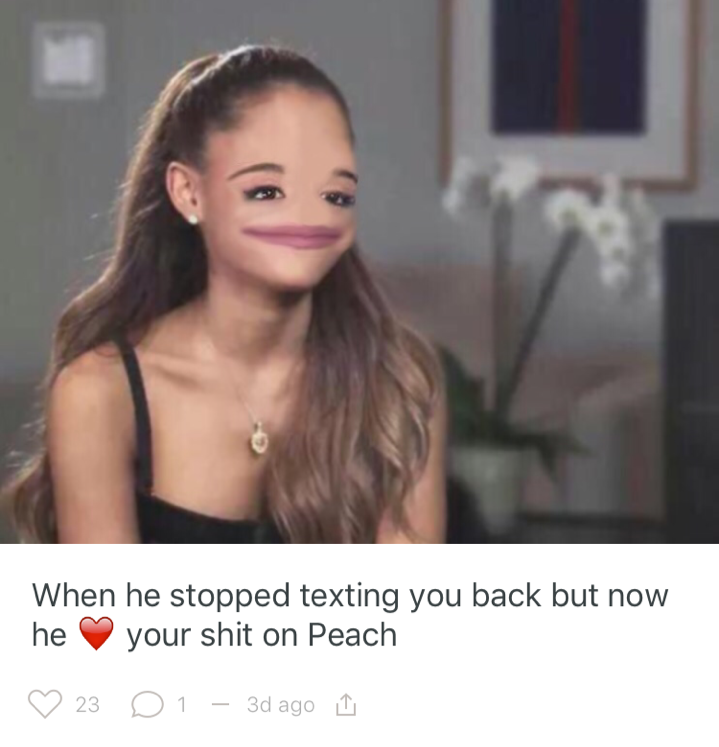 So, can Peach be the platform where we’re Free To Be You and Me? But as apps go, first come the early adopters (and/or teens), then come the celebrities and then come the brands. By the time brands get there, that’s about when things get stale. You can often judge how long an app’s been around by how many brands are active — just like tree rings. So, no, you definitely don’t have to use Peach. But thanks to the App Cycle, it’s guaranteed to be about as much fun now as it ever will. Lindsey Weber is Deputy Editor of MEL. She previously wrote about the many faces of John Travolta — there are many.